The manager of a top festival will celebrate a landmark birthday by singing for the first time since her school days at a special fundraising concert in her honour. Caroline Thomas, from Glan Conwy, who works for the North Wales International Music Festival in St Asaph, was a member of an award-winning choir when she was a pupil at the former Howell’s School in Denbigh back in the 1990s. 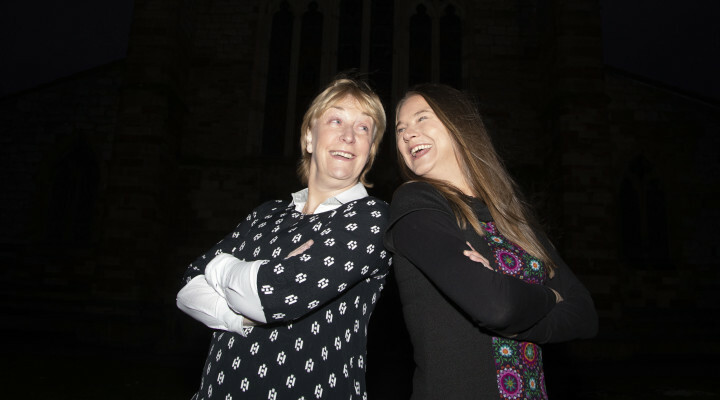 Now the festival’s artistic director Ann Atkinson is putting together a choir made up of Caroline’s school friends to perform with her at the concert at St Asaph Cathedral on Friday, November 16, which will also mark her 40th birthday. Among the other highlights will be performances by Ann Atkinson, who is also a talented mezzo soprano, her husband Kevin Sharp who is a baritone, pianist Chris Frost, the Trelawnyd and Bro Glyndŵr male voice choirs and Côr Rhuthun, under the baton of composer Robat Arwyn. According to Caroline, her birthday celebrations will be nerve wracking because more than two decades have elapsed since she last appeared on stage. She said: “I’ll be singing as part of a small choir and not on my own thank goodness. We held a concert last year in honour of Ann’s birthday and it was such a wonderful and special night which was also a sell-out. “I was thrilled when Ann asked me if I would like to have something similar to celebrate my birthday. “It’s a wonderful idea to try and get as many of the girls who were in the Howell’s School choir between 1992 and 1997 as possible back together. “We’ve also put a post out on Facebook asking former members to get in touch. So far we have around 10 of the choir who have agreed to come along. She added: “The Howell’s School choir under the baton of Alun Jones was very successful and we won the Classic FM Choir of the Year competition and were invited to perform in London and tour in Italy. It was quite an exciting time. Ann Atkinson, the artistic director of the North Wales International Music Festival says the concert will be a wonderful night of music. She said: “We have just enjoyed one of our, if not our most, successful festivals ever with most concerts and events sold out. The festival brings world-class musicians to North Wales to perform in St Asaph Cathedral. “As festival manager, Caroline works incredibly hard on making sure each festival is a success. She added: “I’m delighted to be singing a few songs on the night along with my partner, Kevin Sharp, who is a baritone. One of my top pupils, Elis Jones, who is a tenor, will also be singing. “We also have the Trelawnyd and Bro Glyndŵr male voice choirs singing under my baton and Côr Rhuthun under the baton of Robat Arwyn, who will be singing himself. “We will be performing songs from the shows and some well-known love songs including some of Robat Arwyn’s own compositions. This entry was posted in Arts, Community, Featured, News. Bookmark the permalink.